Disclaimer: This is a long one. I am tempted to name it Part II: Herculettuce. Here's a tip for the hurried types: scroll down to the Three Plaid's Small Voice, What's Up with Lettuce, Three Plaid, and/or Three Plaid Lowdown sections for the most direct (if we can use that word) answer to why our farm grows lettuce 12 weeks out of a 20-week season. Regardless, cheers to both the diehards and the hasties! If you've read Barbara Kingsolver's Animal, Vegetable, Miracle, you'll likely recall hearing the tale of the early 20th century California entrepreneurs who plopped some lettuce and artichokes onto boxcars, packed them with ice, and rolled it all eastward. This mid-winter lettuce chomping, that only the wealthy could afford, laid the groundwork for the now commonplace system of moving produce across country and worldwide. Yearlong consumption of lettuce, and in turn, other types of produce, became affordable and routine with the development of crops bred for cross-country travel and, shortly thereafter, with the arrival of the interstate. The major lettuce variety of the time, Great Lakes iceberg, dominated American plates specifically because it was bred to hold up well on a long journey eastward, and was advertised and marketed to families as the greatest thing since sliced bread. There were heavy prices to pay for this convenience that went mostly unforeseen in the mid to late 20th century. First, the common knowledge that our grandparents and great-grandparents held, like which crops grow best during which season, almost completely disappeared from our collective consciousness. Over a fairly short period of time, we forgot the seasonality of lettuce (among other crops) and expected to see it on our plates year-round. Second, we lost a whole hell of a lot of diversity in our food system. Farmers now had to grow what the market demanded, and in the process stopped growing the myriad varieties that were once enjoyed locally. Many heirlooms took a hit or were lost forever as a result. Third, and perhaps most devastating of all, came the destruction of our landscape. Once peppered with local farms, our land now turned into immense swaths of acreage filled with very little assortment. To keep up with market demand, farmers were persuaded to increase production of a handful of crops to most of their acres; part and parcel of this Faustian bargain was trading their traditional organic practices for pesticides, herbicides, fungicides, and synthetic fertilizers. The bigger the acreage, the greater the need for these inputs. In a brief moment in time, the former millennia-long focus of building healthy soil and thereby producing healthy, diverse crops now gave way to insanely huge production of a select few crops, and with it, a complete neglect of the soil. Soil has been rendered basically dead across our country due to farming practices that prioritize human-made inputs (petroleum-based fertilizers, etc) over that of nature. Sure, plants can grow with the addition of synthetic fertilizers, but the nourishment is superficial and the soil is left entirely spent at the end of the year. The methods of agriculture which dominate the globe these days represent nothing more than an empty system that ultimately leads to indelible loss under a thin veil of progress. Of course, our world is very different from that of the not-so-long-ago, when small farms literally sustained small communities and people preserved food to nourish their families through the winter. Although this type of living is still desirable for some, it is no longer necessary for most. However, as long as people are backing local, small farms, the world is better for it. Let's bring it back to lettuce. What was once a dinner-scape always dominated by Great Lakes iceberg is now a plethora of colors and flavors shared by umpteen varieties offered at local farmer's markets and through CSA programs. From old heirlooms to newly bred varieties, your local small farms are doing their part to increase the diversity of their fields and the human palate. For some years now, small farms have been taking on the fight to regain traditional agricultural knowledge, and we are dedicating ourselves to the diversity and health of our land and food system. We strive, along with many other small farms across the country, to pull away the thin veil of progress promised by corporate monoculture pushers. We aren't pleased with how the dominant agricultural paradigm affects the human and environmental health of our country and world, and we aim to do better. As bridges between environmental and public health, every small farm has its own righteous mission. We small farmers are generally united, knowing we each have our own particular role in the greater fight to change the current beastly system that still reigns supreme. To that end, every CSA program and market farm is suitable for different people and their own unique preferences. The system can only work if a diversity of options is offered, even within the local food movement. We believe in the pursuits of our fellow farmers and beckon folks to choose to support one that utterly suits their needs. Supporting any one of us is supporting the whole movement; so get out there and find your farmer, y'all! Each farm also has its own unique voice. In the case of our small farm, in addition to CSA our main goal is to increase our knowledge of seed saving, taking part in the age-old skill of saving a bit of the past for the health of the future. This health of which we speak depends on the fostering and preservation of genetic diversity in our food system. Think of the potato famine in late 19th-century Ireland: limiting species and varieties can cause devastation on many levels. We hope to join countless other seed savers worldwide to help preserve varieties so that our food system can be healthier for it. Kingsolver points out the ill health of our food system by citing Vandana Shiva, world-renowned crop ecologist, who says that the majority of our food for the last few decades has come from only eight plant species. This stands in direct contrast to the diverse food system our ancestors built over many thousands of years, where, according to Shiva, some 80,000 plants species have been consumed. Yowzers! Though our role may be small, taking part in the re-diversification of our food system lies at the foundation of our mission and, therefore, our farming methods. Because of this core mission, we grow only open-pollinated and/or heirloom crops. By doing so, we are able to save seeds from our crops, ensuring the past will indeed nourish the future. None of this is to say we are against hybrids. We are not. We simply choose to devote ourselves to open-pollinated crops so we can attain our own specific goals. WHAT'S UP WITH LETTUCE, THREE PLAID? Back to lettuce we go. Lettuce is the key example we're using to illustrate the mission of our farm, and on a larger scale, the small farm revolution of which we are taking part. We're using it as a symbol since, despite having a tremendous amount of variety of lettuces to choose from these days thanks to small farmers, the remnants of ol' Great Lakes iceberg can still be felt in that lettuce is still consumed year-round by most of us. It has become habitual. We crave the local and fresh in the spring through fall, and in winter we settle for shipments from out West. Again, we understand ours is a different world than in the recent past. Where people once preserved food to sustain themselves through the winter out of necessity, we now seek nourishment from afar out of a different necessity--because it is what our system and way of life demand. Even the most diehard locavores make exceptions--from bananas to coffee to avocados to, you guessed it, lettuce--so believe me, we're not knocking it. We here at Three Plaid make plenty of exceptions ourselves. We're simply using lettuce as a platform--one tiny example--to talk about why we grow the way we do in direct contrast to that of Industrial Ag. It's more of an illustration of how we do things rather than a good old-fashioned soapbox scolding. Here's the lowdown. Lettuce is, by nature, a cool-weather crop. As soon as temperatures begin to warm, the lettuce plant takes its cue and starts to form a bitter, milky-white substance throughout its stems and leaves. This is an evolutionary response to keep predators from eating the plant as it attempts to reproduce (known as bolting). Anyone who has tasted a head of lettuce as it is starting to bolt knows the bitterness of which we speak. Hybrid lettuces have been bred to withstand more heat than your average lettuce, and even some open-pollinated varieties have been bred to last longer into the season than others. These breeding techniques have lead to a longer lettuce-eating season on many small farms. Lots of people like that, and we think it's pretty great to an extent, as well. However, along with our desire to become seed savers comes our desire to take part in the seed saving custom of growing crops in their preferred seasons and observing them as they go to seed. There are perks to this. 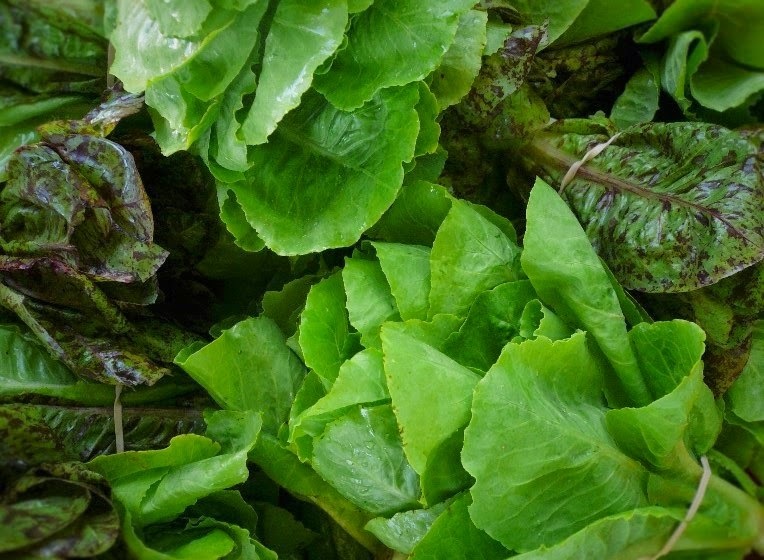 Take lettuce--its flavor is best in the cooler months. It makes sense that plants evolved to taste best at a certain point of the season. We humans selected them over millennia, paying attention to when they grew healthiest and when they had optimal flavor. We strive to follow in that tradition. It doesn't mean we don't understand that even open-pollinated crops are bred to withstand certain conditions. Part of the seed-saving tradition is selecting for crops that have desired traits, and lettuce that lasts a bit longer in the heat is alright by us. All types of natural breeding techniques lead to the diversity that is necessary in our food system. However, we are primarily interested in learning about crops and why they inherently do what they do. While we may grow a lettuce that can withstand more heat, it will still succumb to summer temperatures at some point. And so, we have come up with a 12-week offering of lettuce that is grown to be harvested during its peak of flavor. For reasons listed above, it makes sense our CSA might be a little different since we have a dual aim to also save seeds. And we think that's okay. Our members are the types who want to go on this particular food adventure with us, just like members of other farms are interested in participating in the food adventures of their rockin' farmers. It's what makes this awesome small farm movement gain strength. As our farm grows, we will continue to strive to offer as much abundance per crop as we can muster for our members. Hopefully one year we will have a large enough greenhouse to help us extend our cool-weather production, allowing us to offer lettuce earlier in the spring and later in the fall. But we'll cross that season-extension bridge when we get to it. For now, our eyes are on the 12-week prize. And that's the long, rather than the short, of it. If you'd like to Read Part I of this piece, click here.